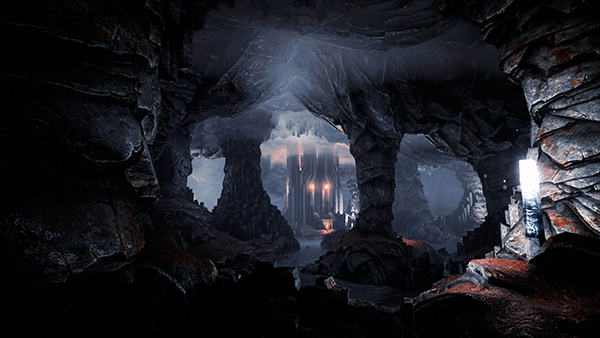 I have just spent a couple of hours exploring a cave system in the VR release of The Solus Project. I don't mean looking at it on a monitor... I mean exploring it. Inside the cave, wrapped by darkness just beyond the torch I'm getting tired of having to hold up. Why hold it up... you can't see much if you don't hold it up and away from you. This whole VR thing could turn into work real fast... except for one fact... it's just too much fun to ever be work. I spent my spelunking time jumping from rock to rock, wading into tepid water then falling into deep water and earning the "DUMMY" badge for extinguishing a lit torch under water. That's no joke, there really is a DUMMY badge and I'm here to tell you that fire and water don't mix even in the VR world. I wear the badge proudly proclaiming it. All of this is after I had crash landed on the planet because of a nasty little incident and had already battled the severe cold of night, a nasty thunderstorm and a killer tornado. I know it's a killer tornado because I walked of my cave like a blithering idiot to marvel at how great it looked. Plenty of time to turn around and duck back into cover right? Wrong. At least I respawned at the cave and didn't have to go through the crash landing again. I even had food and water gathered and properly horded in the cave nearest the crash. Just as I'm starting to get settled in a bunch flaming debris comes plummeting to the planet near my location. It must be checked out so off I go plodding along a beautiful shoreline with a gorgeous double planet/moon in the background in search of whatever it was that crashed near my location. It's not hard to find... just follow the big plume of black smoke. Oh boy... this is getting interesting! In fact, this is what exploring is all about. Surrounded by your environment... completely enveloped by it instead of just looking at it in front of you. Apparently Solus is produced by a small team that is extremely responsive to feedback. The initial Vive navigation system was so poor it ruined the game experience. I played for a couple of hours over two days before deciding to give it a thumbs down because of the interface. Before the day was out there was a reply from the dev to watch for a new update that day with a totally new Vive navigation system. The update was pushed out and I'm happy to say the system was revamped and so improved it cannot even be compared to the original system. The stunning visuals, the puzzles, survival... all improved with the new navigation. All was well in the land of VR. The update gods had smiled upon us. As to the gameplay itself... well it's just what this gamer has been looking for. Exploration, puzzles and building things out of what you find make a nice change from the hard charging first person shooters and crawlers that dominate the game scene today. After the "incident" you will find yourself in survival mode at first. Finding shelter, drinkable water and food are just a few of things you have to concentrate on in the early stages of the game. With the option of point and click teleporting or walking navigation, as mentioned earlier, is much improved and now intuitive. As of this writing I have only had time to put a few hours' gameplay into this title but they have been enjoyable and the time goes by way too fast. I'm just now making it through the tunnels as mentioned earlier and I can still feel a tingle in my shoulder from holding up the torch so long. Since I've very serious about this job I'll leave you now while I go back to the mysterious world to further my quest for survival on the alien and unforgiving land. I'm off once again to explore, poke, prod, mold and generally stare in awe at the awesome planet I've crashed on while becoming the modern day Robinson Crusoe trying to survive and thrive. This Review: Very Positive. A must have addition to any sci fi lovers' game library. Note: Images and videos are the property of the developer.